Whether you’re a physiotherapist or a practitioner who treats pain, Dr. Jo Nijs has great information with regard to healing chronic pain naturally. Dr. Nijs is one of the leading experts in the world of physiotherapy and pain research. He defines central sensitization and the role that it plays in chronic pain. He also discusses why the pain matrix may be outdated but still useful as the dynamic pain connectome becomes front and center. You will also learn all about the microglia and the role they play in sustaining pain, and the top five lifestyle factors that help alleviate chronic pain. You will likewise discover what dry needling, alcohol, manual therapy and some types of orthopedic surgery, and smoking all have in common, and get acquainted with the rapidly evolving field of post-cancer pain research and treatment. We’re talking about the role of lifestyle central sensitization in chronic pain. Our expert guest this week is Dr. Jo Nijs. He holds a PhD in Rehabilitation Science and Physiotherapy. He is a professor at the Vrije University in Belgium. He is a physiotherapist at the University Hospital in Brussels, Belgium. He is also the Scientific Chair of the pain, mind and movements, special interest group of the International Association for the Study of Pain, as well as an expert panel member for the Health Science Division of the Flemish Research Foundation. Jo runs the Pain in Motion International Research Group. His research and clinical interests are patients with chronic pain, with a special emphasis on the central nervous system. At the age of 42, he has co-authored more than 200 peer-review publications, attained more than $7 million in grants income, has supervised 30 plus PhD projects and served more than 240 times as an invited speaker at both national and international meeting with regards to pain. Jo was ranked first in the world amongst central nervous system sensitization researchers, second in the world among chronic fatigue syndrome researchers, fifth among whiplash injury researchers and sixth in the world among chronic pain researchers. 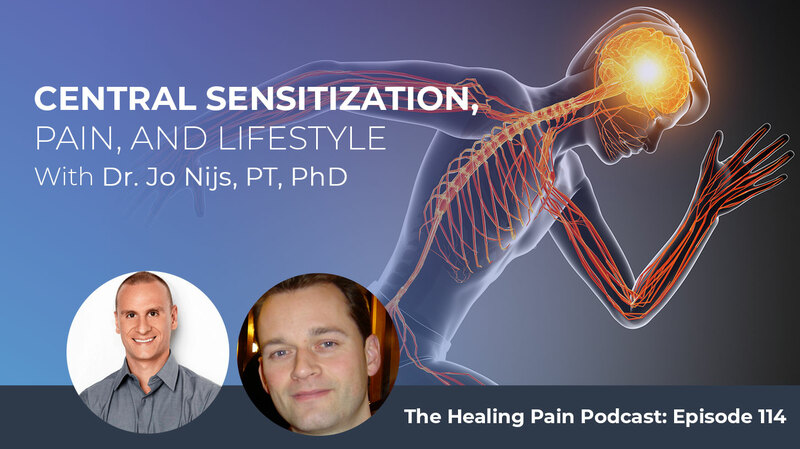 On this episode, you will learn all about central sensitization and the role that it plays in chronic pain. Why the pain matrix may be outdated but still useful as the dynamic pain connectome becomes front and center, all about the microglia and the role they play in sustaining pain. The top five lifestyle factors that help alleviate chronic pain, what dry needling alcohol, manual therapy, some types of orthopedic surgery and smoking all have in common. As well as the rapidly evolving field of post-cancer pain research and treatment. Dr. Nijs is one of the leading experts in the world of physiotherapy and pain research. He has great information whether you’re a physiotherapist, a practitioner who treats pain or you’re someone interested in learning the latest with regard to healing chronic pain naturally. I want to thank Dr. Nijs for joining us in this episode and let’s begin. Jo, welcome. It’s great to have you here. She sent me her MRI which is quite detailed. It shows severe disc degeneration at T12 to N1, loss of the disc space, annular bulging with osteophytes throughout her entire lumbar spine. Foraminal narrowing, advanced degenerative changes in the posterior facet joints with loss of some height there. At the end, it says that she has severe lumbar degeneration with a minor spondylolisthesis and degenerative changes that suggest old reactive discitis. Both you and I know as PTs, this is probably a common MRI scan that we see in many patients with chronic lower back pain, not just those who are 80 years old. Where would you start with this type of patient as far as offering some support and advice? We need to always do a thorough history taking, clinical examination, and examination of the full medical record before we can give any type of advice. The first main message would be the thing that I always do when I received this kind of emails, bring guidance to those people and explaining that it’s impossible to give them any useful advice through email without ever having seen them in real life. That brings me to the next main message that I would give them in advice to these types of request is that we need to always do a thorough history taking. A thorough clinical examination and examination of the full medical record before we can give any type of advice. Radiological diagnosis can be an important element in the assessment and the clinical reasoning process, but they should not be taken as a strict diagnosis that we advise that we need to do surgery or need to give them whatever type of treatment. Unfortunately, it’s not that simple and we need to have a total biopsychosocial assessment of the patient. Then we can see what’s the bio part adds to the overall suffering from this particular patients. The tricky thing is to explain this to patients via email without making them angry and without disappointing them. It’s frustrating and most people with chronic lower back pain have had back pain for a long time. They’ve seen lots of different types of practitioners. As you mentioned, an MRI scan is an important part of starting to look into a biological cause for lower back pain. What are some potential red flags that this person may need to be aware of as they look for a solution for themselves? The good thing about the imaging is that your red flags can be identified. I understand that the situation in the United States is a bit different and that you do have direct access to physical therapy which is not how it is in Belgium. Even though we have a Master of Science degree as an entrance level for our profession, but we don’t have direct access. We just lay back at and rely on the physician who is referring us the patient. That’s one of the major benefits of imaging in general, that you can easily rule out a number of crucial red flags. It’s not only the imaging that’s available to identify or exclude possible red flags but that’s an important resource and it might even be more valuable to do that rather than providing a specific information on what is particularly causing the pain in patients with lower back pain. I have to say, referring back to this particular case, you mentioned that she had a severe osteoarthritis at more than three subsequent levels of the spinal cord. She’s rather older and that she’s got a higher age. That combination is probably the only subgroup within the spinal osteoarthritis population which appears to have some connection with a spinal pain. Osteoarthritis of the spine isn’t a nonspecific finding which has no association whatsoever with back pain or lower back pain in particular but seems true for neck pain. If it’s an older patient with three subsequent levels of severe osteoarthritis in the spine, then it might be a factor. I’m not saying that it’s the reason why they’re suffering from pain because everyone who understands pain just a little knows that it’s impossible to say that’s the reason why they’re suffering from pain. It’s much more complex than that but at least it has some association in that subgroup of the population with pain in the spine. In the older population, you mentioned there are three levels of osteoarthritis. In the clinical reasoning process, are you starting to think that there’s a potential there for a fracture or there’s potential there for degeneration that’s severe enough that it may need a surgical intervention? No, I’m not saying that it would need a surgical intervention and I’m not saying it’s dangerous for fracture either but that’s the second option. When it’s a severe osteoarthritis, it’s important that it’s not just some osteoarthritis but it should be classified as a severe osteoarthritis according to the radiologist. It contributes to the pain experience and then it can be part of the osteoarthritis spine problem. Even in that case, I wouldn’t recommend but we even consider any of the fancy surgeries that they have for this type of medical problems. I would still go with the conservative approach, the lifestyle approach, the educational approach and those things. Because there are many other things besides that biological factors that are important. It’s still important also to recognize in those patients that this can be effective. The biological factors can play a role. We cannot do anything about those biological factors in the strict sense. You mentioned surgery but we know that those types of surgery, in general, don’t work or there is not enough evidence to support their use at that group level. It’s not recommended to do something about the specific diagnosis, but we can do a lot of things for those patients through all those sustaining factors. Through all those cognitive-emotional factors that shape the pain experience that they are having. Reassurance is a big thing in relation to that. That should be the focus of our treatment for a specific diagnosis. When we are reassuring our patients, when we are educating our patients, we need to be aware of the possible role of those biological factors play. In developing the therapeutic alliance with our patients, it’s very crucial that we have that right from the beginning. That we don’t go against the beliefs of our patients but rather extend and broaden the view of the beliefs of our patients. That’s probably the main thing about those biological factors. That clears the bar for the communication and therapeutic alliance. The communication between the clinician and the patient is often the most important. I always like to say that rapport beats out any methodology that we have in a lot of different ways. You mentioned lifestyle and I want to touch on pain education and explaining pain and some other things. You do have a pretty vast amount of research out on the topic of central sensitization and what it means for those with chronic pain or chronic lower back pain. Can you explain what central sensitization is for? Central sensitization is a natural process. It’s a way of protecting the human body from getting more damage. For instance, when you experience traffic accidents then your central nervous system will increase its awareness, its sensitivity to protect you from doing any possibly damaging things. Just to keep yourself down for a couple of days to rest a bit more and to allow tissues to heal completely. After a couple of days, that increases the sensitivity of the central nervous system which can be compared to an alarm system which is switched on. That alarm system should switch down again after a couple of days. If that doesn’t happen in a natural way, then this central sensitization thing becomes maladaptive. The alarm system stays active even when there is no reason anymore for the alarm system to be turned on. Then you get all these increased sensitivity symptoms that continue over time and that are debilitating. It not only increase pain severity but also spreading the pain and sensitivity to other stimuli and other sensory sensitivity symptoms. Before I go into the lifestyle factors, there’s a debate over things like the pain matrix. Is there a pain matrix? Do we know exactly what’s happening in the brain? Is the pain matrix even a current concept or is it outdated at this point in some ways when it comes to looking at functional MRIs or looking at what’s happening in the central nervous system when it comes to the sensitization of pain? We talk to neuroscientists who are totally into the field of fMRI and all those other fancy techniques that are available to monitor brain activity in response to potentially a painful stimulus, for instance, or in those constant threatening tasks. They tell us that the pain matrix concept is outdated and it doesn’t align with what we currently understand about pain and chronic pain in particular. They now talk about pain connectome rather than pain matrix because it’s more dynamic than we originally thought it was and it’s also context specific. In the end, the concept of a pain matrix in its more simplistic and old version is still very relevant and probably enough to make people understand much more about the complexity of pain. For the scientists, it’s important to let all the science evolves and to get more information and to get a true understanding of how the brain is also contributing to the pain experience. Probably it was a bit too simplistic to understand that the pain matrix is responsible for all the pain they’re experiencing. That it’s a fixed set of combination of areas within the brain that are communicating with one another and producing pain. Although the general idea is still a lot of variable but it’s more complex and a bit more dynamic. It’s a bit more individually tailored to them as we originally thought it would be. Besides shaping communication between the neurons, glial cells also have a role to play as immune cells within the central nervous system. It goes back to an image of what’s happening in the brain. It doesn’t necessarily point to a cause. In some ways, they are beautiful fancy pictures but it doesn’t tell the entire story. Talk a little bit about the pain connectome and what that means. It’s a new topic that we haven’t explored on the podcast yet. I wouldn’t go too much into detail because talking about the pain connectomes is interesting but it’s also a bit too simplistic in itself. What we are increasingly interested in is the activity not only in the neurons within the brain but also in the activity in other alliance cells within our central nervous system, more particularly the brain. That brings us to the glia within our central nervous which far outnumber the neurons but have always been a little bit understudied because they don’t communicate using action potentials. They don’t show up when you use EEG to monitor brain activity and therefore, they have often been understudied. We always talk about the central nervous system. It’s focused on the neurons, on the neural tissue. We used to think that the glial cells are there just to support the neurons, but we now know that they play a crucial role also in shaping the communication between the neurons. When we talked earlier about increased sensitivity in central nervous system, we know that the glial cells play a crucial role in triggering this. 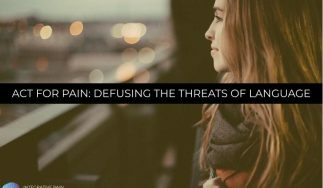 In sustaining this increased sensitivity in the communication between the neurons and between the different areas of the brain that communicate together to somehow produce the experience of pain. That increased understanding that is vastly developing right now is not included in the pain connectome. That’s why I don’t want to put too much time and effort in explaining all the details about the new fancy things about pain connectome because it’s even much more complex. Talking about the glial makes our view much broader in relation to chronic pain. There are now data from Marco Loggia’s lab in Boston, in the US and also data from Sweden, in Stockholm Institute. They found identical things in terms of increased glial activity in several types of chronic pain, including nonspecific lower back pain, including radicular pain, including fibromyalgia. I probably missed a few other pathologies. We have now increasing data from human studies to back up earlier findings done in animals that there is increased glial activity in many patients with chronic pain. This fits well within our understanding of central sensitization. Also, we know that increased glial activity implies that those glial produce neurotrophic factors and inflammatory substances that increased the sensitivity of the nearby neurons. This fits well within our understanding and also explains why it’s fixed at several areas within the brain but it’s much more complex. I’m happy that you fast forwarded us to that conversation about the glial or the microglia. For those who don’t know what microglia is, can you explain what type of cell it is? It’s in the nervous system, but it’s not nervous tissue. It’s between all those neural tissues and in between those neurons. They far outnumber the neurons but I’m not saying they are more important than neurons. At least they are equally important that they sometimes tell the neurons what to do and what not to do. In general, besides shaping communication between the neurons, they also have a role to play as immune cells within the central nervous system. That’s another function. They sometimes are called the immune cells of our brain, of the central nervous system, but that’s a bit unfair to other cell lines within the immune system. Also, they are less mobile because they stick within the central nervous system while pure immune cells can go anywhere in our body. That’s the main things the audience can learn at this point from glial cells. Before we move on to how lifestyle affects central sensitization and the glial cells, is glial activation something that’s innate that happens in the human? Is it something that only happens in those with chronic pain or is it something that maybe someone genetically has a marker that causes this sequela to happen in people? We know it’s not a specific thing to chronic pain patients, that’s for sure. We know that there are increased glial activity differences in multiple sclerosis as well and probably some neurological disorder like Alzheimer’s disease, there is some mentioning of increased glial activity. Also, we know that in severe obesity that you can get increased glial activity. It’s not a specific observation field of chronic pain on its own. The most astonishing thing about it is that it’s probably from all that we know from human studies which have been known right now. It’s not just a group observation. There are those observation studies, they compared patients with specific chronic pain diagnosis with those not having pains or are healthy controls. Not as a group observation but at the group level, the chronic pain group turned out to have increased glial activity compared to the healthy controls. That was obvious but when they look at the individual level as well, they identified each single individual increased glial activity. Also, mentioning that it happens in other illnesses like obesity, multiple sclerosis and a few other neurological disorders as well. It doesn’t mean that it’s a real nonspecific thing because it’s also related to the area of the brain. It’s in fibromyalgia patients who have widespread pain and widespread symptoms and also many other symptoms besides pain. They appeared to have increased glial activity all over the brain. I’m not saying in all areas, but it’s spread in different areas of the brain. While the thalamus was one of the few regions where they identified an increased glial activity in lower back pain patients, where you have a more localized pain problem. The picture that they see within the brain scan that they use to monitor those glial activities somehow matches the clinical picture as well when you match the increased glial activity in those specific brain regions. In which the functions of those brain regions that we already aroused. That’s also important. We have to say that there’s much more work to be done in the future, including examining what they have done in animals already to see whether the glial activity is the etiology of chronic pain or that it’s just a sustaining factor. We don’t know for sure. We know from animal world that it’s can be a triggering factor, that it can be on the basis of the chronic pain problem but we don’t know for sure in humans. Then the next step is to see whether we can manipulate it interpretively and that we can decrease productivity to a normal. Which makes sense when you look at some of the scientific literature so far, but that’s based mostly on animal work. I know it’s an interesting area of research that’s growing. Like you said, animals first and then we’ll see if we can apply it to humans. Then we get specific to certain conditions, diseases, diagnoses to see if we can manipulate it with the various treatments that we have that we used as healthcare practitioners. Talking about those treatments, we’ve talked about some of the complexity of chronic pain, how complex it can be from a neurobiological level. Talk to us about some of the more lifestyle factors that can start to potentially change central sensitization and glial activation in a way that helps people cope and helps people move forward in life. One of the lifestyle factor studies in relation to chronic pain is physical activity and physical inactivity and sedentary behavior. We know that in general more physical activities is good for decreasing pain levels and increasing the quality of life and also making the human body of the chronic pain sufferer healthier. That’s not news. We know that it’s been shown over again in so many studies. That’s the number one lifestyle factor. Other lifestyle factors are somehow less well-known. One is stress. Stress is a logical factor but also a powerful sustaining factor. We know that we can do a lot to better allow patients to manage their stress. One golden rule here is that there are no real stressors but it’s the interpretation of the situation that creates stress. To get to this type of understanding across our patients is often a challenge but it’s a lot of fun. For headache patients, it’s a crucial part of the treatment but also for many other patients. There’s much to learn about the interaction between nutrition and dietary habits in relation to pain. Physios were often aware of this and were able to do this. Many physios have some skills somewhere out there to help our patients to better manage stress. When we reflect on how often we use them in clinical practice, it’s often not that good. There’s a long way to go before we can use all our available skills to integrate stress management much better in our daily practice. Not only in chronic pain patients, but many other patients. Stress and physical activity are two important lifestyle factors. When we talk about stress, we go to sleep problems. Many but not all chronic pain patients have sleep problems. There’s a role to play by a clinical psychologist, but if the clinical psychologist is not readily available for the patients within your team or within primary care, that the patient will see both physio and a clinical psychologist. When that’s not possible for the patient for financial reasons or for whatever practical logistic reasons, then we as physios can also provide some sleep management to our patients. We’re running a large trial where we examined whether physios are able to integrate a cognitive behavioral therapy for insomnia for the treatment of our chronic spinal pain patients. We don’t know whether they’re able to do so but at least we’re giving it a fair chance. When you look at the backgrounds that we have in our training, we should be able to do it. We do have evidence right now from a series of studies all over the planet that physios are able to provide from the behavioral therapy in general to patients with chronic pain, standing next to the behavioral therapy for insomnia. Clinical psychologists do a lot of good things for chronic pain and many other patients but sometimes their availability for patients is a struggle for them. I mentioned stress, sleep and physical activity, those three lifestyle factors. Others are smoking. Smoking habit is probably a well-studied lifestyle factor which is often overlooked. We typically ask our patients whether they are currently smoking or whether they quit smoking or whether they intend to quit smoking. If they don’t have any intentions of quitting smoking, we know that it’s is a yellow flag for not progressing well within the treatments. That’s an indication that it will be difficult to change their health or lifestyle behavior because if they don’t want to quit smoking, why would they increase the level of physical activity? That’s another one and this brings us to foods in general, nutrition in general and that’s something that I would like to discuss with you because you’re from that area, which is an exciting area. We’re starting to develop research in that area as well because there’s much to learn about the interaction between nutrition and dietary habits and in relation to pain. This has been studied to some extent in osteoarthritis but not on nonspecific neck pain or whiplash or fibromyalgia. There are some works in fibromyalgia, it’s an exciting area. I know that many physios are keen to learn more about nutrition in relation to pain. That’s what we’re trying to do ourselves right now. We’re trying to learn more about nutrition in relation to pain. When you mention the option of therapeutic targeting of decreasing glial activity associated neuroinflammation, then one route is nutrition as well because of the many anti-inflammatory options you have with changing diets. It’s more common practice within the field of cancer and post-cancer care, but not so much in the field of pain. It’s an exciting time for physios in general but anyone who’s into pain science. They are exciting times and nutrition is new to physios. I gave a lecture at the National Student Conclave which is for PT students here in the United States. I gave a lecture on nutrition. I spoke about and going in softly about the Mediterranean diet and what the research says about the Mediterranean diet when it comes to different types of diagnosis. You mentioned osteoarthritis, fibromyalgia, metabolic syndrome, obesity, different types of autoimmune diseases because there are so many, but RA is probably the most common one. The one place where we don’t have a lot of research as far as nutrition goes is spinal pain. There’s a little bit of research that looks at things like cardiovascular disease and how that affects spinal health. There’s a little bit of research around how nutrition affects neurotrophic factors and anti-inflammatory or pro-inflammatory factors with regards to spinal pain. It is one area that has not been built out yet with regards to nutrition. You’re a researcher, maybe you’ll take on that challenge. I’d love to tackle that with you and give you some ideas. One of my mentors is Elizabeth Dean, who is a physical therapist. She teaches at the University of British Columbia in Canada. She did a meta-analysis on the ability for physiotherapists to counsel on lifestyle-related changes that are needed. Her studies specifically looked at stress, smoking, nutrition, and exercise. Exercise is a no-brainer but some of the other areas are new. When we start looking at the multifactorial nature of pain and all the things that lead to central sensitization, poor coping, activation of microglia, you have to look at all of these. I’ve got a little bit effect around this. People say to me, “Why do you have a nutritionist on your podcast? Why don’t you just focus on PT? Why do you have a psychologist on, why don’t you just focus on nutrition?” I say, “If you’ve ever worked with people with chronic pain and you’ve talked to them, taken a good history and looked at the things that they’re struggling with, these are all the things that they struggle with. 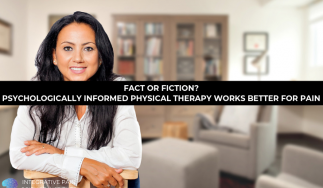 Physical therapy is wonderful and when I say physical therapy, I mean traditional therapeutic exercise, manual therapy, potentially some modalities here and there. Even in the PT realm, things like explained-pain, therapeutic pain, neuroscience interventions have done wonderful things for our profession, but we have peers that latch onto that like the Holy Grail. Why might something like explained-pain not be enough when it comes to working with someone with chronic pain? I couldn’t agree more. Explained-pain has been crucial in motivating PTs and many other professions to learn more about pain neuroscience and pain biology. It’s obviously not good enough. When you look at the effect sizes of only explained-pain, they’re simply not good enough but better with other interventions. You get medium to sometimes even large effect sizes and then you get to the large effects. You won’t get those effects and positive results unless you also do explained-pain first. Explained-pain to me is still a crucial factor to motivate your patients to create a therapeutic alliance and to make them invest time and energy in exercise or whatever lifestyle factor which is needed for the patient. Therefore it shouldn’t be overestimated but it shouldn’t be underestimated either. It’s that combination which is crucial to integrate treatments for patients. Even though CBT, when provided properly, does integrate a number of interventions. It typically has these different modules which are combined. You often have a physical activity module. You have a stress management module. You have a cognitive module. It’s often a combination or at least a multimodal treatment. On the other hand, I’m thinking out loud now, I’m not basing this on real strict science, but when you look at a large number of trials done like CBT for people with chronic pain. When they were done, the therapists were typically psychologists. I’m not speaking against psychologists, but those patients who participated in the trial where they get psychological treatment, that’s a subgroup of the chronic pain population. It’s unlikely to be the same subgroup of chronic pain patients that we, as physical therapists, are seeing them for practice. The majority of the people who come to see a physical therapist for whatever kind of chronic pain problem are not open-minded to a psychological approach per se. That’s probably one of the biggest values of explained-pain, that it changes the mindset of those patients. If you create a much broader understanding about their pain problem, then they’re open-minded to do also these behavioral types of interventions, which they will no longer regard as a pure psychological conclusion. Just to say that we shouldn’t just focus on those results of our CBT trials. You can dive deep into the research and start to pick apart the things that are potentially problematic with the studies and what they mean in real life. Let me throw out things to you like dry needling, massage, orthopedic surgery. What are those things all have in common for people who are looking for pain relief potentially? That’s a nice combination. I would even add smoking to that list. They all have one thing in common, that’s they do something good for the patients in a short term. They give quick pain relief. Also, smoking similar to dry needling, similar to hands-on manual therapy. I was trained as a manual therapist, so I’m allowed to say it. It gets some quick pain relief, get some short-term pain relief from that and that’s evidence-based. Even if patients never have smoked in their entire life, they can get initial short-term pain relief from smoking cigarettes. The effect sizes are similar that you get from the pain relief, from dry needling, acupuncture, hands-on manual therapy. Probably the effect sizes at the beginning regarding pain relief are larger but in the long-term, it’s all the same. They don’t fix any problems. They create some dependency on passive treatments, although we cannot say that smoking is a treatment. 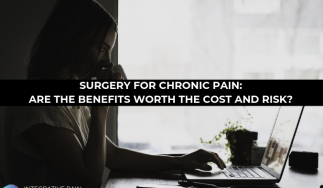 All those options that patients have to get some pain relief are short-term solutions, they’re not a long-term solution. It’s even worse than that. They somehow prevent the patients to find a long-term solution and invest time and energy in lifestyle change because there are these short-term solutions. Alcohol can be on that list as well. The number of people surviving cancer is spectacularly growing. The problem is that they struggle with debilitating symptoms like chronic pain. There are some things that may help short-term but they’re not long-term solutions to help people cope and overcome what they’re dealing with. I want to make sure we plug your research group. People can go to www.PainInMotion.be, that’s where Jo and his research team work. They have wonderful studies and a bunch of people with PhDs and people still working on their PhD projects can be found there. I know cancer research and pain related cancer is one thing that you have your eye on. Can you talk about why that’s important? A lot of PTs don’t focus on pain and cancer research. It’s an increasing population, that’s for sure. The population will only grow because biomedical treatments for cancer are evolving. We don’t only have surgical and radiotherapy and chemotherapy, but there’s also this fast-growing area of immune therapy with a Noble Prize. There are also founders of immune therapy for cancer treatment. The number of people surviving cancer is spectacularly growing which is very good news. The problem is that those patients survive cancer but they struggle with debilitating symptoms like chronic pain. Up to 40%, 50% of the patients surviving death have chronic pain. A similar number have chronic fatigue, sleep problems. You have to be aware that once they get the diagnosis of cancer, this is a real traumatic stressful experience. The stress will continue throughout the entire process of cancer treatment which is often years of cancer treatment. Their body is under constant stress and that’s why it’s not surprising to see study results where you see that their natural stress response systems are exhausted. Helping them in managing everyday stress much better is something we can do for them. They typically decrease their level of physical activity during a cancer episode or cancer treatment phase. They need to slowly rebuild their physical activity level. One of the major risks factors for getting or developing new cancer is that you already had cancer before. Even though you survived cancer, that’s one of the major risk factors for getting cancer again. It’s important for them to adhere to a healthy lifestyle. Also, to have good nutritional habits because that’s a major thing like you mentioned yourself in the field of cancer. All those factors are the things that we can do for our patients and we can provide treatment which is useful to them. I didn’t even mention bone health. Bone health is a crucial thing because many of the aggressive cancer treatments decrease bone health. This is invisible to the patient and to many clinicians. We as physios are well-trained to do some preventive treatments or interventions that can improve their bone health as well. There’s much we can do as physios for those patients. Patients are grateful to physios who provides a good treatment them. It’s an exciting area but there’s much to do for motivating physios apparently to involve in that specific area of population. I know there are some physios that are working in hospitals where cancer care is provided. The things you’re talking about is the long-term prevention things that can help people thrive after they’ve had a cancer diagnosis and after they’re done with the type of treatments they received. These treatments help them extend their life but can be damaging to many of the cellular components inside the cells, that keep energy producing, that keep them healthy and vital and help all the different systems in our body. It has been great chatting with you. Your research is key and the approach you have is probably rare in our global efforts to help people with pain. Once again, tell everyone where they can find you and some of the exciting things you’re going to be working on over the next year or so. The audience is mainly concentrated in the US. I’m getting back to the West. On March 8, 9 and 10, there’s a conference in Denver organized by Ipsy. I will be lecturing there together with Dr. Iris Coppieters from our group. In South America we will be giving a course in Chile after the Denver Congress, so 16, 17 March. We will be giving a course on stress and sleep management for physios in Chile. That’s the most things that we will do within the US in the upcoming year. Other courses are also announced on our website. We have a list of courses and they connect to the website. I want to thank you once again, Jo, for being on the podcast. You can find out more information by going to www.PainInMotion.be. I ask you to make sure you share this out with your friends and family on Facebook, Twitter, LinkedIn, whatever favorite social media handle you use. I want to thank all of you for joining me this week. Stay tuned and hop onto the email list at www.DrJoeTatta.com/Podcast so I can send you a new podcast training to your inbox each week. Thank you very much. Jo Nijs holds a PhD in rehabilitation science and physiotherapy. He is a professor at the Vrije Universiteit Brussel (Brussels, Belgium), physiotherapist/manual therapist at the University Hospital Brussels, and holder of the Chair ‘Exercise immunology and chronic fatigue in health and disease’ funded by the Berekuyl Academy, the Netherlands. He is the Scientific Chair of the executive committee of the Pain, Mind and Movement Special Interest Group of the International Association for the Study of Pain (IASP) and Expert Panel member for Health Science division of the Flemish Research Foundation (FWO). Jo runs the Pain in Motion international research group (www.paininmotion.be). His research and clinical interests are patients with chronic pain and pain-movement interactions, with special emphasis on the central nervous system. The primary aim of his research is improving care for patients with chronic pain. At the age of 42, he has (co-)authored >200 peer-reviewed publications, obtained €7 million grant income, supervised 10 PhD projects to completion (excluding 20 ongoing PhD projects) and served more than 240 times as an invited speaker at national and international meetings in 24 different countries (including 27 keynotes). He trained 2,458 clinicians in 77 courses held in 11 different countries spread over 4 continents. His work has been cited >3800 times (h-index: 35), with 23 citations per article (ISI Web of Knowledge). Jo is ranked 1st in the world among central nervous system sensitization researchers, 2nd in the world among chronic fatigue syndrome researchers, 5th among whiplash injury researchers, and 6th in the world among chronic pain researchers (expertscape.com).